Even nonbirdwatchers take an interest in the magnificent peacock. Part of the pheasant family, the peacock is arguably the most beautiful bird on Earth with his bright blue, green, red, orange and gray display. 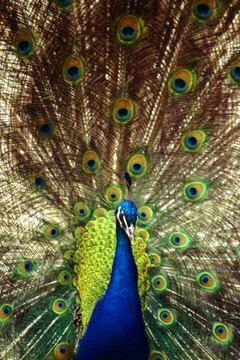 The gorgeous colors of the bird's bluish body and multicolored feathers are associated with the males, which are the peacocks. The females, called peahens, are mostly dull brown or gray with short feathers and are not as spectacular to behold. Peacocks have elaborate feathers to show dominance and to attract peahens for mating purposes. The prettier the peacock, the more peahens he attracts by strutting around and shaking his feathers. Note that the feathers are not his tail feathers. You find the tail underneath the feathers. The peacock also makes a sound almost like a cat's meow to attract peahens. Peacocks are polygamous; they wish to attract and mate with as many peahens as possible. The males tend to stay together in a peacock version of a man cave or a bachelor pad, waiting for the females to come around. Peacocks and peahens do not see each other again after the mating process is over. The peahen leaves to lay her eggs, usually around three to eight eggs that are brown. She digs a shallow hole in the ground, making sure tall grass or bushes hide it, to lay the eggs. She then sits on the eggs for about 28 days. Peacocks don’t raise their young; peahens do. Peahens tend to live close together and help each other raise the babies, called peachicks. Peahens can begin mating when they are 2 or 3 years old. Most peafowl can live to be 20. Peacocks forage for food on the ground during the day and eat any chance they get. They eat nearly anything they can. Their diet in the wild usually consists of insects, snakes, grain, grass, worms, frogs, snails, seeds, fruit, flowers and different area crops. Peahens spend several months teaching their chicks what to eat. Although peacocks don't get along with many other birds, they are social with each other, and groups of them are called parties. It's typically only older peacocks that stay by themselves. Peacocks sleep in tall trees, which is called roosting, to protect themselves from other animals. They make shrieking sounds to alert each other of danger. How Long Does a Sparrow Care for Their Young? Which Bird Nests Without the Father?